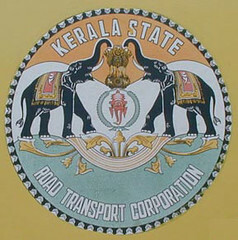 KSRTC or Kerala State Road Transport Corporation is a state run transport company operating services in the South Indian state of Kerala. The corporation is fully owned by the Government of Kerala. The corporation runs bus services for different sections of the society ranging from the expensive "Garuda - Volvo service" to "Ordinary" Services. 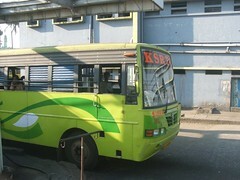 KSRTC buses account for about 10% of the total number of buses in the entire state. 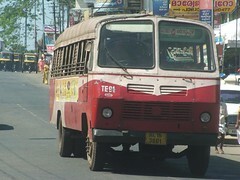 The transportation segment of the state is monopolised by Private bus operators, while KSRTC handles only the nationalised routes. 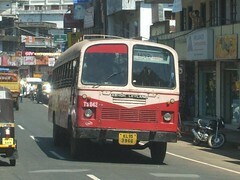 KSRTC buses are often referred to as "Aana" meaning Elephant in Malayalam (the official language of the state of Kerala). They are called so because of two elephants present on their logo. Financially, This corporation is a "White Elephant"! It spends around 23 rupees per kilometre while the collection is a mere 20 rupees per kilometre! (According to official figures!). Around 45% of their buses are more than 7 years old. Travelling is quite airy on KSRTC buses - This is a feature absent on most of the other state run corporations. Older buses are comfortable for their longer leg space as compared to the newer ones. Buses for KSRTC were always manufactured at their own Workshops, and hence were never stylish. They had just the bare minimum facilities, and always looked run-down as compared to buses from the neighbouring states. But, the corporation went in for a spin sometime during 2001-03. A very young minister, Shri KB Ganeshkumar took charge of the department. He introduced quite a lot of changes in the corporation. He introduced two brand new Volvo buses into the fleet (the corporation still has only those two buses!). He revolutionised the design of buses, and new designer buses with colourful bodies were born! His tenure was very short, and was quickly replaced by his father, who did nothing new to the corporation. Ministers kept changing while the designs got minor changes - and seriously nothing new! 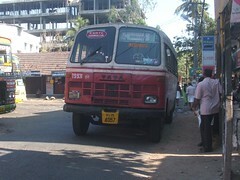 Earlier KSRTC had a peculiar design for Leyland buses - a somewhat "nosy" design! But this design was replaced by flat designs somewhere in 1997-99 period. The old "nosy" design. The bus is a "Fast Passenger"
The new "Flat" face. Such bodies are no more built. They have been replaced completely by "designer" bodies like the "yellow" superfast above. The design above is now finalised, and newer buses are now rolling with such designs. The windows still have the good old airy shutters. The shutters were completely raised, the bus becomes airy and no passenger would ever sweat! The journey on KSRTC is always a charm on itself! Conductors are never bothered if the buses run empty! They are more concerned about the bus sticking to its schedule, and hence KSRTC drivers are always known for their ruthless and rash driving! 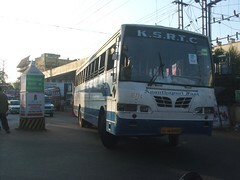 KSRTC buses are always guaranteed to reach their destination on time, and in the least possible time! The main problem with KSRTC is that they are in heavy losses! They keep losing money every year. There is no major turn around program for them. They lose heavily on the inter-state routes to private buses and SRTCs of other states. Karnataka is an example. Karnataka's KSRTC run all luxurious buses including Volvos, while Kerala SRTC runs all run-down buses on the route. A comprehensive turn-around policy would be to introduce more deluxe and super-deluxe services. Add more Volvo buses to the fleet, and face private operators head on! Introduced more buses and stand strong as a challenge to private operators within the state! 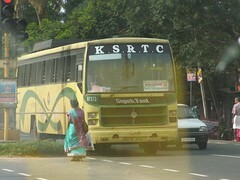 I would love to see KSRTC getting back to profits, and becoming a trusted transport company in the south! Hope this article is complete! As far as parur is concerned KSRTC is its life line .unlike other places the relation of the crew & passengers is gutter less .parur Alwaye is the first nationalised route in kerala .So thre is no un healthy competetion like private busses. once try Alwaye Parur route u won't forget.Get down at mannam and get world famous MANJALY HALWA -a solid sweet thunder which will melt in to ur mouth.long live KSRTC@Parur. Hi Binai, do you know when SFs were introduced(I think in 1992-93 and buses in TR series), it used to be extremly faster. They used to cover Kottayam-TVC route in just 3 hrs!!!!!! Two WDPs causing an earthquake!